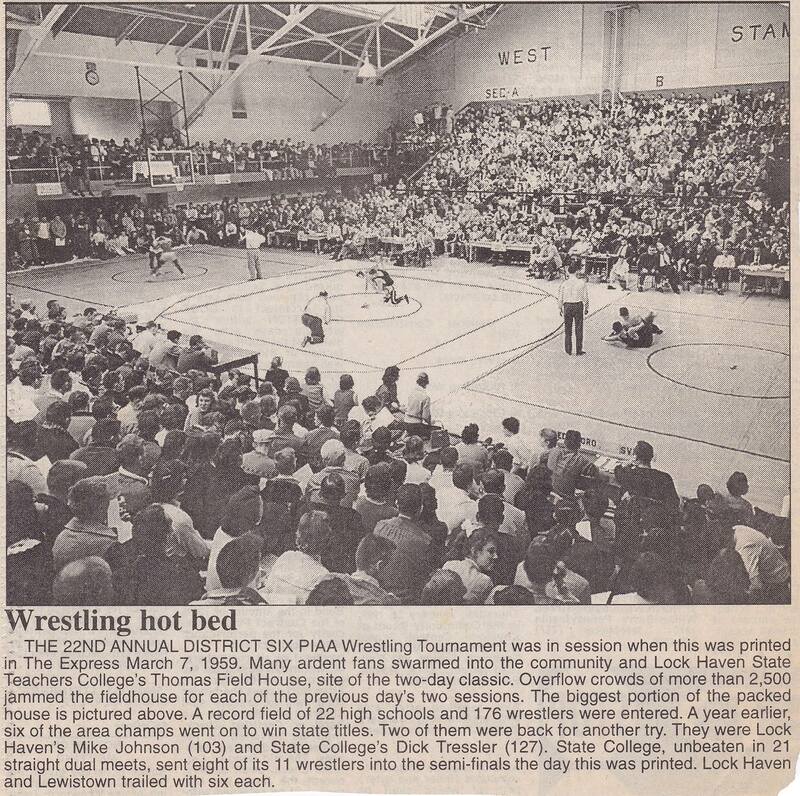 This is how I remember high school wrestling where I lived; packed gyms and enthusiastic crowds. The photo is representative of a typical District Championship in the state, a week before Regionals and two before States. During these golden days of wrestling in Pennsylvania if you were lucky enough to snag a pair of tickets to anyone of these events, and you let people know you had them, you were opening yourself up to a home invasion. The sport was that popular. And yet, what you can’t see in this photograph is the hundreds of fans that were turned away after standing in line for hours hoping for a ticket. Support of high school wrestling in America was that strong and at its zenith during the 60’s and collegiately in the 70’s when almost 800 campuses had wrestling. Today you can find a seat at almost any scholastic match and anywhere you’d like to sit regardless of when you arrived while there are only 77 Division I wrestling programs left. Oops, now it’s 76 and falling as you read this . . . So what’s going on; how did all this happen? Probably the largest reason is the sport hasn’t kept pace with America’s insatiable hunger for quality entertainment in connection with the planet’s rapid growth of technology. Today, the number of diversions available as a result of this technology is mind boggling. What can’t you watch in the comfort of your own living room? What can’t you find to read on a Kindle or learn from Siri that between the two of them has made libraries virtually obsolete? The world now has Play Stations, iPhones, iPads, iTunes, iPods and iCan do whatever I want, whenever I want at almost wherever I want; but not us, no sir, not wrestling. We’re man’s oldest sport and if people don’t see wresting’s greatness, that’s their issue. And that’s exactly the attitude that companies who are no longer in business embraced. Where’s Sears now, once the leader in retail sales who thought they were too big to fail is owned by K-Mart, a company whose current slogan is “We Still Exist.” Seriously, that’s their slogan . . . sounds like someone from wrestling gave them advice. The bottom line is if you’re not finding ways to make your product faster, higher or better you’re about to get passed up or swallowed by those who are. As to the outdoors, kids have motorized skate boards, drones, blue toothed sound systems and the opportunity to compete in anyone of 741 sports that didn’t exist 40 years ago; everything from 3D Archery to Zui Quan which is a form of boxing with a twist, of lemon that is, given that the competitors must be inebriated to participate. There’s even one called Aquathlon that I can’t imagine you’ve heard of before. I know I hadn’t. It’s a water sport where two competitors wearing masks and fins wrestle underwater in an attempt to remove a ribbon from the other person’s ankle. The match consists of three 30 seconds periods; I assume a 3-2-2 would be out of the question if they wanted to end the competition with the same number of combatants as they had when it started. Now granted, wrestling has gotten better but by comparison to the competition that is listening to the consumer and doing something about it, we appear slower, lower, and worse. All you have to do is look at the number of empty seats we have at our events, the percentage of young men who don’t return to the sport from one year to the next, the record number of forfeits we’re registering at duals, and the dramatic drop in program numbers. What else does anyone need to know; or dare I mention, there’s not a single program in America that’s making money. The point is, global competition for eyeballs is exploding exponentially and the hunger for entertainment options has never been greater. But only those who are actively working to provide faster, higher, and better will manage to exist. Wrestling, on the other hand, spends its time focusing on what coaches want or believe they need, and if anything positive happens after that, it’s by mistake or as an afterthought. This might be one of the reasons why FloWrestling doesn’t always get great reviews from wrestling’s elite; they thumb their nose at traditional thoughts, and you might say, go with the Flo regarding faster, higher, and better. Some don’t like Martin due to his roguishness, but it’s made him a millionaire several times over and that’s in spite of wrestling’s decline. Maybe treating our sport as a business really works; we should try that someday. Here’s what I believe I know . . . in order to get back in the race for survival, we need to focus on the consumer and have an aggressive business plan. No wait; that would mean we’d have to have something that resembles a corporate structure and leadership team. Sadly, neither of those has ever existed and why the photo above will always be reminiscent of the best we could do. Regarding the negativity I expressed above, it’s clearly a fault I have when I’m frustrated. And it’s maddening because our community always sees the glass as being half full just as I do in my personal life. But we’re talking about the future of wrestling and don’t have time for rainbows and lemonade. It’s our lack of goal setting that’s so strange and funny if it weren’t sad. Talk about a dichotomy, there isn’t a member of our sport who hasn’t set lofty goals when it came to their days as a competitor – or as a coach. But they turnaround and seem clueless – or apathetic when the future of the sport is on the line. It’s confusing and it’s discouraging. God help us, the NCAA is kicking around the idea of taking our NCAA tournament to some of the nations domed football stadiums. Talk about a terrible idea but I do have to give the NCAA two thumbs up for looking at alternatives, it’s more creativeness than our leadership is showing. But I have to ask them to think twice before they pull the trigger on this idea. I understand the pluses, yes, you would have more space to spread the mats out and be able to place the scoring tables a safer distance from the action. Both sound like good ideas but are minor when you consider the number of injuries that tables haven’t caused over the years. And why would anyone want to wear silk scarfs to minimize the chaffing that would occur from swiveling their head from Mat 1 to Mat 8 and back again for 3 solid days? Having the mats closer together only enhances the spectator experience. One NCAA Executive, who’s in charge of our championships, recently expressed that the use of dome stadiums may be appealing from an ascetic standpoint so when you look down on the 8 wrestling mats on the first day of the championships, you see all of them perfectly framed by an acre of artificial turf. In addition, the athletes would have more space to warm up as well as additional space for the media personnel to set up. But are any of these really pluses? Me thinks this executive is missing the obvious – which is servicing the needs, wants, and desires of the fans while enhancing the spectator experience. Sadly, that was never mentioned. The conversation was only about the athletes and event logistics. Why are we always overlooking the important? No one cares where the athlete’s warm-up or if they do, as long as it’s not in one’s line of sight. K.I.S.S. Keep it simple . . . spectators want, expect, and demand a reasonable return of enjoyment for their expenditure in time and money. Allowing athletes to warm-up anywhere except in the tunnels means someone is getting cheated out of seeing what is taking place on at least one of the mats. And if the tunnels are used for warm-ups, isn’t that two to three times farther away for the athletes to walk to get to their mat? Why is that a plus? And think about it, in a football stadium – the best seats in the house will be over 100 feet away from the nearest action and 250 feet away from the outside mats. Then add to that those impossible to read Lilliputian sized score clocks; how are the folks going to see without binoculars or have a clue as to who is actually wrestling and winning? To really enjoy wrestling, you have be able to see where a hand is placed on a leg, notice how each athlete is fighting for inside control, heck, for those who did see how Valencia’s fingers ended up inside Hall’s headgear you can forget seeing that again if you’re in a football stadium. Sitting in the upper deck of a basketball arena makes the combatants look like ants, can you imagine how small they would seem in a domed stadium. If anyone wants to point to the Iowa – Oklahoma State dual meet two years ago as an example of what’s possible with fan support, many may not realize that dual preceded one of the Hawks football games. So having an impressive number of spectators, although memorable, might be a little misleading. None of this will increase our fan base and will only frustrate those who bought into the idea. The old adage about seating for events has never been truer. “If you’re only going to have 2 people show up for your event, hold it in a location that seats 1. That way you’re assured to have a sell out and standing room only crowd.” That’s Economics and Marketing 101. As an aside, the first location the NCAA is considering is the yet to be a constructed stadium in Las Vegas for the Oakland Raiders. Vegas might be fun if we weren’t in session afternoons and evenings for three straight days. Two things to consider here . . . 1) 80% of all the college programs in America and their fan bases reside east of the Mississippi so why are we flying out west and 2) how many more seats will be unoccupied during the opening rounds on Thursday and the consolations Saturday morning by those who are sleeping in because they enjoyed the city too much? As I mentioned in my last blog, we aren’t filling all the seats at the NCAA’s now, and they’re being held in stadiums that average around 17K seats. So tell me one more time, why in God’s green earth would we want to put 15K fans in a 75K seat stadium? Who’s been smoking what? Think for a moment when you watch some of the NCAA Bowl Games on TV and you see the end zones and upper decks devoid of fans, what goes through your mind? Folks, it’s a football stadium, are we really going to allow the NCAA to pick a location where 70% of the seats are guaranteed to be empty? It’s ludicrous and almost laughable until you realize they’re actually serious. Might it be time to reach out to our wrestling fans to determine what they want and need and then be creative in the fulfillment – why are we guessing? Yes, nothing worse than empty seats which takes away energy and excitement. And absolutely agree that wrestlers the size of ants (because you’re in nosebleed seats) doesn’t make sense for this kind of sport. I was horrified when I heard they are considering domed stadiums—-and putting up a curtain to section it off is ludicrous, too, IMO. The 21st century is fast becoming the century of virtual reality. Perhaps the focus on fans in stands is wrong. Video record everything. Broadcast matches through the internet. Have preliminary matches be free to the public, at first, to drum up interest. Only charge for viewing matches when you actually have a fan base willing to pay for the privilege. It’s your call if championships should be pay to watch or free. It depends on the willingness of the fan base to pay for the privilege. You must give free samples to get fans. The free samples must be what the fans want to watch. Think what a business does. If it can’t hype a product to sell the product full price, it either gives away free samples or has sales to drum up interest. You solve many problems with this approach and get many advantages..
Every fan has a front row seat, or at least the same seat the video camera has. If you do it right, every fan will see and hear what the referee sees and hears. Fans will begin to feel like they are part of the action. How many times do fans complain they can’t see the action? You want to have multiple video cameras to capture the action from multiple angles. One camera would capture the shoulders as they are held to the mat so the fans can see what the referee sees. Another camera would capture the faces of the competitors to capture their emotions. A third camera would capture the pinning situation from another angle. Cameras are cheap and getting cheaper. If you’ve ever been in a TV studio, you know there are at least 3 cameras in use. One camera is on the host. The second camera is on the guest. The third camera is used for two-shots. Have GOOD video camera operators who can anticipate the action and aren’t afraid to have closeups of the action and closeups of the faces of the competitors to capture the technical skill involved, the intensity of the struggle, and the emotion of one wrestler working for a pin and the other wrestler fighting against being pinned. Do it right so you don’t even need the referee on the mat. That’s another fan complaint. Fans can’t see the action when referees are in the way. The only people needed on the mat should be the wrestlers. A referee doesn’t actually touch the competitors, or shouldn’t have to. The referee can bark orders and send the sound of a mat slap signalling a pin using a parabolic speaker. Let the fans hear what the referee says as if the fans were on the mat right next to the referee. Don’t forget to capture the sounds of the wrestlers. The referee gets to hear the wrestlers grunt and groan. Capture the sounds of the wrestlers using a parabolic microphone. Intensity and emotion come through sound as much as seeing. You can give the fans a completely new experience. You can give the fans the experience what it is like to see and hear what the referee sees and hears. You can make it possible for the fans to feel, vicariously, they are the referees. You can measure interest by measuring how many different people watch the videos. You can determine what pleases the fans by measuring which videos of which matches get watched over and over. With this information, you can fix the wrestling rules to encourage what pleases the fans. You can tell coaches what pleases the fans. Do you think fans would enjoy matches more if they see and hear what the referee sees and hears? Do you think the technology now exists to make this happen? Again I say, get with the 21st century. Embrace the technology to make your product more enjoyable and better. The technology is getting cheaper all the time. Here is a link to parabolic microphone. If you don’t want to opt for a parabolic microphone, consider a shotgun microphone. Embrace the technology to make your product better. Let the fans experience what the referee experiences. I guess I am wrong to believe the referee can do things remotely. The referee may or may not have to touch the wrestlers, but the referee has to be able to get in the wrestlers’ faces to get their attention should a potentially dangerous situation arise. Am I correct in my belief a pin is determined by visual inspection, and not by actually touching the wrestlers during the pinning situation? 1) The referee will always stand nearby the action, but out of the way of the cameras. The referee will check for infractions and potentially dangerous situations and stalling. The referee will not decide scoring or calling a pin. 2) the scorekeeper and timekeeper will watch the match, remotely, on video monitors. The scorekeeper and referee will agree between them when points are scored or a pin is scored. 3) one doesn’t need a parabolic parabolic loudspeaker. The referee will order the wrestlers to start or stop. 4) one can either mic the referee or use a shotgun mic to capture the sounds from the mat. The referee can wear an ear bud to hear the scorekeeper and referee. 5) if you adopt the rule, time running out doesn’t end the period/match when a pinning situation is in progress, the timekeeper will not have to worry about the clock while watching for a pin. Again, what is the goal? The goal is to make the fans feel like they are on the mat, part of the action. The fans need to see and hear everything. The referee and the coaches and the scoring clock must not be in the way to block what the fans see or hear. Wrestling and other martial arts would be ideal for this kind of virtual reality experiment. The wrestling mat is like a stage. There are only two actors, the wrestlers. You can get cameras in different positions to cover the action from different angles. There are too many actors in football or basketball or other team sports. The actors are constantly running from one end of the court to the other end in basketball making the placement of cameras to capture the action from different angles difficult. The same is true for football with the actors running from one end of the field to the other end. You have the chance to make wrestling a true fan sport where the fans can feel like they are on the mat, part of the action. The same cannot be said or done with any of the team sports. My guess is that you did not speak to the individual directly who you are referring to in your post and also message back to Jason. If you did, you would know that he clearly has the fans in mind in what they are looking at and how to enhance the fan experience. I have been fortunate to work with this individual over the past number of years, and he is always thinking about things from a fan perspective and how to best engage the fans. In addition the decision where the event goes is made at several different layers and is not controlled by one person. Thanks Pat, good clarity. All I can go by is what this gentleman said in an article I read where he thought stadiums were a reasonable option. But we have the same issue, nothing has changed. Why would we ever think to go to one? What are the benefits? I’ve outlined some of the negatives and for the life of me I can’t think of one good reason why it benefits the sport. I’m very aware I don’t affect any decisions that are made in the sport. To think so would be arrogant on my part. I write hoping to make other people think where the sport is headed and eventually begin to question leadership. Anyone who believes we’re doing okay or anywhere close to okay is fooling himself. The facts are we continue to stick our heads in the sand while far lesser sports pass us by. It’s frustrating at best. Appreciate the information, and I respect all that you give to the NWCA. You’re thinking about the domed stadiums in the wrong way of framing the mats. To think they’d just put them dead center of the field, yeah, that’s ridiculous, but it’s also not logical and not in the cards. One such stadium has numerous configurations for its events and is rumored to be set up for 24,000+ seating — I seriously doubt (based on what I know about the facility and how it can function), they would put eight mats dead center. That seems to be a prevailing thought from people who remember UNI from 20 or so years ago. That isn’t going to happen. You have a great mind in thinking outside of the box, but the domed stadium idea, you’re not thinking outside of the box here — various configurations for various sporting events and positive sight lines can (And do) exist in some of the newer buildings. Think outside the box when it comes to mat placement — if it’s dead center — then no, that wouldn’t be a good idea, but I know that’s not going to be the case should a large stadium get a bid. Jason . . . thank you for the note. It appears we’re on the same page – but just to clarify. I was quoting from the NCAA representative who is in charge of selecting the sites and commenting on his ideas and thoughts. This gentleman never mentioned the fans, not once and that’s where I’m coming from. Everything should be about the consumer, not the athletes, officials or coaches. Now we don’t want to dismiss those three groups and we haven’t ever to the best of my knowledge. But we do ignore on a regular basis those who are paying the freight. As to various possible configurations, yes that’s true, we could make several things work? But for what purpose? That’s the 10,000 dollar question. I don’t care how you fit 15K or 20k people into a 75K stadium, it’s going to look stupid! Why would we do that, what’s the benefit? So we can say we were in a domed stadium and somehow become more important as a result? No matter how we configure the stadium except the normal way it will look stupid. We don’t need to try and make the best of a bad situation. Whether black curtains are used to hide unused seats or the mats are pulled to one side of the arena it doesn’t benefit the sport. So I guess I’m saying I don’t want to think out of the box here, I can make almost anything work, but why do we want to with domed stadiums when basketball arenas work perfectly fine. All be it we haven’t mastered what could be done for the spectator there either. Agree on the absurdity of domed stadiums. Comments regarding the impact of technology on our society are redundant. While kids keeping their faces glued to a computer screen is common, I am not sure much can be done about that. Wade’s previous blogs put forth some interesting rule changes. Be great to see some of his rule suggestions implemented. We need to make wrestling more entertaining to watch but we really need to increase the participation levels. Thanks Ed for reading and responding. You’re right, we can’t do anything about computers and kids attraction to them, my remarks were meant to say that there are so many entertainment sources out there now, that we must be willing to work, unlike Congress, in a manner that collectively helps us to improve our product. If we’re not moving forward then we’re backsliding as there is no coasting in today’s market place. Still well my friend.